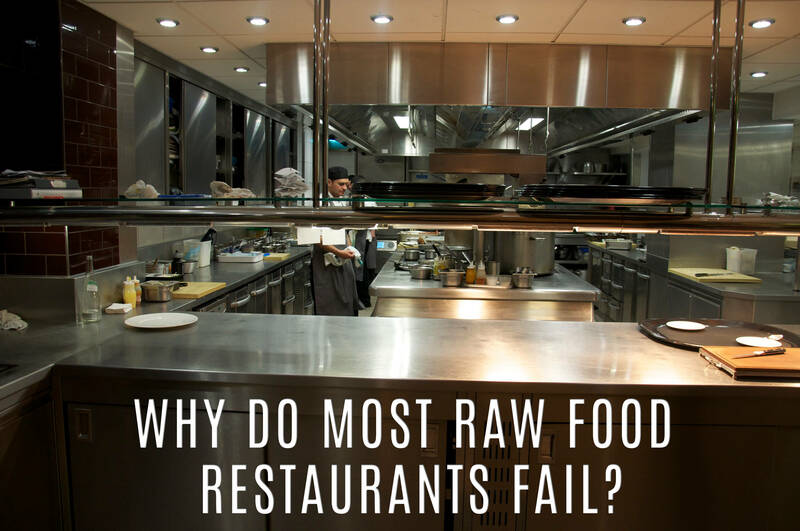 Why Do Most Raw Food Restaurants Fail? I decided to write on this topic because it never ceases to amaze me how quickly new raw food restaurants go out of business. This phenomenon happens in almost every major city in the world, from New York to LA to London. As soon as you hear about the opening of a brand new raw food restaurant in town, you get excited; sometimes even before you decide to pay the first visit, someone tells you the restaurant has already closed down. How could this be possible? Where could raw food restaurants go wrong? 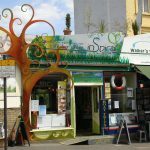 The raw food movement is getting attention all over the world day by day, and we still don’t have a wide spread selection of cool raw food restaurants around town, like any other type of food. With the exception of very small raw food restaurants that are located in super secluded areas, the choices for eating out with a raw food menu are very slim. I draw on my many years of experience living in London and hanging out in the city, from my professional observations of many failed restaurants over the last 10 years, and my experiences as a customer of many dozens of restaurants. 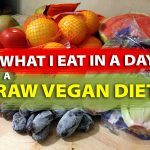 Eating the correct raw food diet means you get most of your calories from eating fresh fruit – which is not something you go to a restaurant for. The average person that eats out at restaurants expects to stuff themselves with food, calories, and stimulation; and it doesn’t work like that on a healthy raw food diet. A healthy raw food, such as fresh fruit and vegetables, does not “stimulate” your senses like eating meats, grains, and other foods. Hence people don’t drink alcohol when they eat fruits and vegetables, but do when eating meats, pasta, and so on. What is wrong with food that stimulates, you may ask? Well… anyone who studies nutrition properly knows that stimulation and nutrition exist in inverse ratio – the more you are stimulated by food, the less nutrition you receive, and vice versa. Visiting a raw food restaurant for the first time is going to be a boring experience for a person that eats the standard American Diet. Why? Because if you are used to eating highly seasoned and stimulating foods, such as burgers and chips, eating raw food recipes will taste like cold vegetarian food, and naturally, most people won’t like it. Well… In all truth, whoever thinks raw food is boring is somehow ignorant. Why is that you may ask? What most people don’t know is that your taste buds change dramatically after you eat a raw food diet for a few days. Taste buds go through a life cycle where they grow from basal cells into taste cells, and then die and are sloughed away. According to internationally known researcher, Dr. Bartoshuk, their normal life cycle is anywhere from 10 days to 2 weeks. Once your taste buds are no longer exposed to daily stimulating and excitotoxic substances such as salt, sugar, and spices, they again develop an appreciation for the taste of sweet, fresh fruits and vegetables. In fact, on top of enjoying the flavours of fresh fruits and vegetables, your taste buds will start to dislike, if not downright hate the flavours of junk food and most cooked food in general; which obviously is a great thing because you become healthier. This is also the main reason why the majority of the public will never get used to eating out at raw restaurants, because it implies a change of lifestyle. “Low Fat” Raw Cuisine Is The Way Forward. Many raw food restaurants have tried to overcome the issue of taste as I explained above, by adding lots of fat and condiments to their recipes, and in this way appeal to more people. I decided to pay visit to a well-known raw food restaurant in London’s Mayfair on one occasion, called 42 Raw. They served a gorgeous looking lasagne and I thought, OK, I’d give it a try. What did I think after eating the lasagne? The lasagne recipe was so full of oil, seeds, and condiments that it didn’t taste nice at all. Not only that, but I had to rush to eat something sweet right afterwards, just to get rid of the oily and extremely salty taste of the meal. Was this a healthy eating experience? Of course not, neither healthy nor fulfilling. Naturally, I never visited that restaurant again, and they (like most other raw food restaurants I’ve tried) are also out of business. I believe the way forward is to have raw food restaurants that serve only low fat (oil free) raw food recipes, as well as offering a wide variety of fresh fruit – and I mean plenty of fresh fruit to choose. In this way, you can start your meal by eating fresh fruit, and then onto a tasty but lighter dinner, which I believe will be a far more satisfying eating experience altogether. If you’d like to comment on this post, I’d love to hear your opinion. You are either inexperienced or incorrect. The problem is in service. Raw food is delicious. That is why folks are attracted to it. Making raw and living food is labor intensive and it is that wait which turns folks used to innediate service away. I respectfully disagree. I don’t think raw foods taste delicious first time for someone used to eating MacDonald’s and other junk food. As the owner of an organic vegetarian wholefoods cafe I would suggest you are both right. Also, look to your comment that before you decide to pay a visit it has already closed down – probably because there were not enough customers. 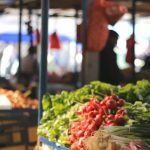 As a niche market, it is difficult to attract a critical and sustainable mass; add to that the cost of labour intensive dishes and quality produce… you can’t make enough money off serving fruit to cover overheads. I’m not an expert, but I think, that in most cases, restaurants make a profit out of people having drinks with their orders… which, as educated health enthusiasts as we are, we know it’s not convenient. Maybe, thats where raw food restaurants are getting the wrong balance. I think there is a dichotomy between gormet raw and a simpler, fruit-based style of raw. 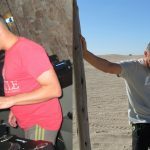 I learned the simple way 14 years ago and love it. I have only been in raw food restaurants a couple of times and besides being out of my budget, the dishes alk had ingreduents I don’t eat. (oils, dried spices, lots of dehydrated ingredients, lots of ingredients in general). My idea of a great time eating out was in Thailand whete there are plenty of stands that serve you freshly harvested fruits, peeled and sliced. You are right about the calorie intake, which is hard to get from one meal. I think the best way for a raw food restaurant to survive is to offer an awesome all you can eat veggie and fruit bar. With some vegan dressings, maybe a couple of soups, and offer real juices and smoothies! I would eat there everyday. Hi Ariel, your next visit to London you should visit Pharmacy restaurant in Nottinghill. It will change your opinion about the raw food restaurants. The food is excellent and there is a big choice of different delicious dishes. Nice friendly atmosphere and people are quing ourside to get a table. It seems like it becomes more and more popular. What everyone has left out is this: Most people running the restaurant know nothing about running a business. They might know food, but the raw food restaurants I’ve been in have lacked experienced owners, who think just because they are offering a raw food experience, people will come. WRONG! Here in the San Francisco Bay Area, there have been many tries, but few have succeeded. The one or two still surviving know their customer base, and NO, everyone does not want to eat fruit, and again NO, people who eat McDonalds don’t go to raw restaurants. 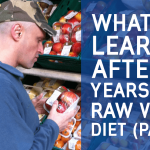 Your article isn’t approaching the real issues: There are many ways to eat raw: Ann Wigmore; Natural Hygiene: Fruitarian, etc.And those people who know raw trends and the basics do survive. Those who just pile it all together don’t. And expense is an issue, but it doesn’t have to be the whole issue. What you have experience in London is not the issue here in the US. Raw vegan food is as delicious and interesting as cooked food, if done by a creative chef. People need to be educated about its benefits. It’s the same problem as under-informed people voting against their best interests in elections. Yes, there are many philosophies of what constitutes the most healthful raw vegan lifestyle. I myself eat nuts and seeds and use them in my recipes. Contrary to the post we are commenting on, I don’t eat many fruits at all because I think the sugar content is too high, except for things like berries and green apples. I agree with you, I have no interest in going out to eat at Raw Food Restaurants. I am more interested in getting the most nutrients in food. I would much prefer to eat at home where I can spend a fraction of the money to get 2 or 3 times more nutrition. Hi Ariel.Pierrette and I have been on the raw band wagon for many years now and realized how hard it is to help people. 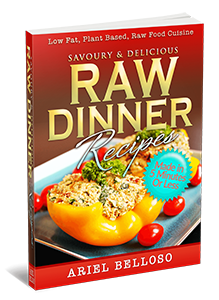 Having Raw taste buds took us years to understand.We are 90% raw and so much healthier because of it. Your KISS principle method is great and I endorse all of your messages, posts and recepies. We use many of them ourselves. If people only knew what we do, they would all be in Heavan. We are, and hope to help others believe. It takes a healthy body to have a healthy Mind .Then and only then can the Spirit help everyone make the right decisions based on what God has given us all, here in Heaven(earth).